INCA Internet's Emergency Response Team's official blog. : [Issue] Zombie phone on calling for Korean user? [Issue] Zombie phone on calling for Korean user? INCA Internet response team announced malicious file report about containing bot function. Damage case of this kind of Android malicious files hasn't been reported so far, though; this malicious file can work as a Zombie phone which can perform data breach and remote control. Especially, this malicious file can check Korean APN(Access Point Name) and has a possibility of spreading its infection range to Korea. Android malicious applications are spreading via 3rd party market, various black markets, and even on Google official market. Opened platform is a merit of Android, however; various security threats can be menace. 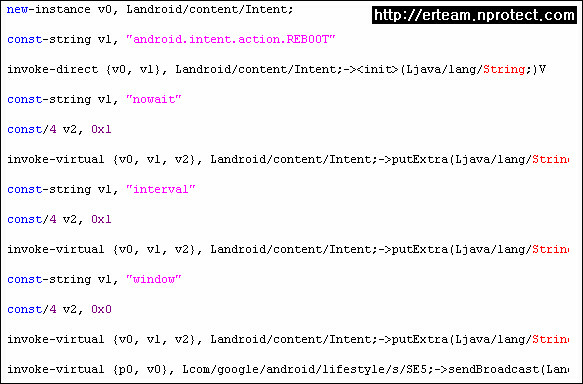 In case of this malicious application was come from Chinese unofficial Android market. This malicious application needs various permissions as following. We can find on "Settings" -> "app" -> "manage"
This malicious application doesn't have its run icon and only runs on background. In case of Bot function, it can be performed on certain condition(string). When certain SMS is received, code will work and check condition and perform malicious function.. This malicious file collects IMEI, IMSI, and GPS with following code. 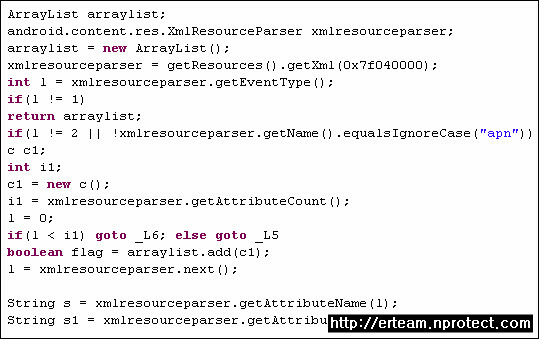 Besides, collected information will be sent to certain site after being XML parsed. This malicious application sends SMS including collected information and run status of code. With this code above, it removes send history itself. User can't recognize its sending status. This malicious application check voice call status with listener after being infected, and it records voice call on certain condition as a .amr file. This malicious application registers malicious service and tries to capture screen as a .jpg. This malicious application checks APN and settings with following code. - Access Point Name (APN) is a configurable network identifier used by a mobile device when connecting to a GSM carrier. The carrier will then examine this identifier to determine what type of network connection should be created, for example: what IP addresses should be assigned to the wireless device, what security methods should be used, and how or if, it should be connected to some private customer network. 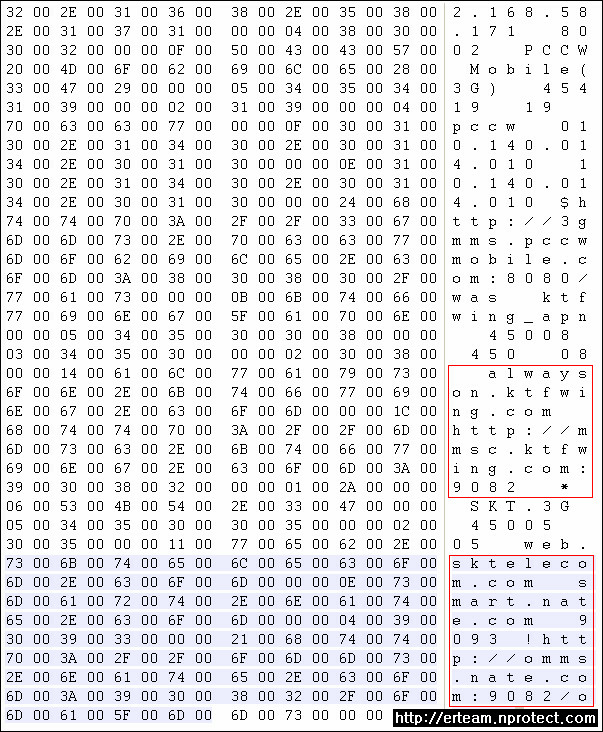 Parsed XML contains various APNs including Korean APN(web.sktelecom.com, ktfwing.com). This malicious application can kill on certain application with this following code. However, this API works on SDK 2.1 or lower version. To work completely, this malicious application needs to be rebooted. "android.permission.REBOOT" can work rooted phone only. This malicious application tested on Android phone in Korea. But it didn't perform all malicious functions. 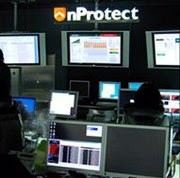 INCA Internet (Security Response Center / Emergency Response Team) provides diagnosis/treatment function with "nProtect Mobile for Android" for mobile such as malicious file stated above and runs responding system against various security threats. Visit this source http://spying.ninja/mspy/to get even more understanding how does the malware works and how to protect yourself from being hacked.